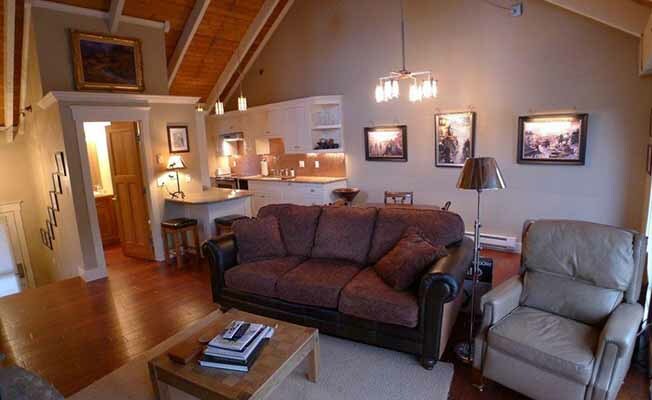 Glacier Condo is a 2 bedroom, 2.5 bath Condo that can sleep 4. Absolutely, unequivocally the best deal in Big Sky at only $95/night in the summer. Winter ranges from $150-$225/night This Glacier Condo has been remodeled with unparalleled detail and includes designer finishes and amenities throughout. The unit features unobstructed views of the 18th hole of the Big Sky golf course. Moose and other animals can frequently been seen from the deck. Beautiful open floor plan with Arts & Crafts style kitchen, wood-burning fireplace (unlimited firewood), built-in cabinetry for 42" Flat-screen TV and desk, 2 bedrooms, 2.5 bathrooms, upper deck with gas BBQ and gas fire pit feature, and lower deck with comfortable hammock. Access to the Glacier Condo pool, spa and sauna is also included. The home has a high-speed 6Mbps DSL internet connection with strong WiFi signal throughout, local land line telephone, and DirecTV with the PREMIER PACKAGE getting almost every channel DirecTV offers including HBO, Starz, Cinemax, Showtime, NFL Sunday Ticket, MLB Extra Innings, NBA League Pass, NHL Center Ice, College Basketball, College Football and much more!